Is your reporting process more difficult than it needs to be? It’s time to track down and conquer the monsters lurking in your organization. 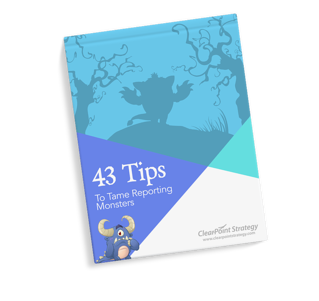 “Meet” the reporting monsters, so you can better identify them and understand the damage they may be causing your organization. Determine what makes these monsters tick. Discover important tips and tricks to overcoming (and helping) the monsters. Download this free guide today, and learn how you can get your reporting process back on the right track.